Sure enough, just as I’m close enough to fill the camera frame with tyre smoking car, I lift off a tad, the front end grips again and we’re heading in the direction the tyres are pointing instead of over the photographer. SAAB is at great pains to call its all new 9-3 a “sport saloon”. To most keen drivers, “sport” means oversteer. 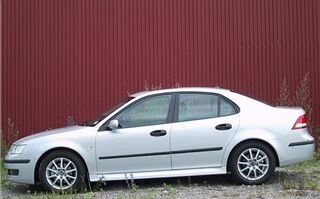 But to SAAB is has always meant progressive understeer because that’s how Eric likes it. If a SAAB 96 understeered too much, you’d lift off slightly and full control would be yours again, even on ice or snow when using the freewheel. If you wanted an old SAAB 900 turbo to tuck in, you touched the brakes with your left foot. The finer points of controlling understeer only started going a bit awry when SAAB was forced to use Vauxhall/Opel platforms; firstly the Cavalier’s for the 900, and secondly the Vectra’s for the 9-5. When SAAB chassis engineers got really stuck in they made enormous improvements turning the Cavalier-based 900 into the old 9-3. And, last year, they also transformed the 9-5 into a vastly better car than it was before. But now, instead of trying to fix the compromises of a mass-produced floorpan, they worked on the development of the GM Epsilon platform itself. So the new Vectra is vastly better than the old Vectra because of their input. And the floorpan was already designed with their own special tweaks in mind. The new 9-3 is a saloon, not a hatchback, because a hatchback can’t be made as rigid without becoming seriously overweight. This doesn’t just benefit the longevity of the car and passenger protection in a crash, it enables the suspension to work better. 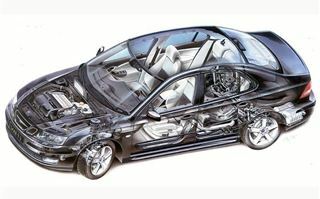 In fact, the new SAAB 9-3 is more than twice as stiff as its predecessor. The steering rack is mounted low to give better feel and precision. The lower front suspension links and hub carriers are aluminium to reduce unsprung weight, and they’re mounted on the same subframe as the steering rack. The rubber subframe mountings themselves are laterally stiff for good steering response but longitudinally compliant for good ride comfort and isolation of road noise from the cabin. The rear suspension is four link, and the rear hub carriers are mounted on two solid bushes at the front with a more compliant bush at the rear to cut understeer by giving a degree of rear steer, but never one that turns into oversteer. The result of all this is excellent ride quality and handling that, though biased towards understeer, is probably the safest, most progressive in the class. ABS, EBD (electronic brakeforce distribution), ESP (electronic stability programme), CBC (cornering brake control) and TCS (traction control system) are all standard kit. Even with the very good, non-intrusive ESP system switched off, you’d have to try very hard indeed to crash this car. SAAB engineers didn’t just have a hand in the GM platform of the car, they also helped to design the engine. This isn’t the old SAAB chain-cam four pot that had its origins under the bonnets of the Triumph Dolomite and TR7. Instead, it’s a short-stroke 2.0 litre turbocharged version of the lightweight aluminium 2.2 chain-cam Ecotec that powers VX220s, Omegas, Vectras, and top Zafiras and Astras, incorporating twin ‘Lanchester’ balancer shafts for smoothness. 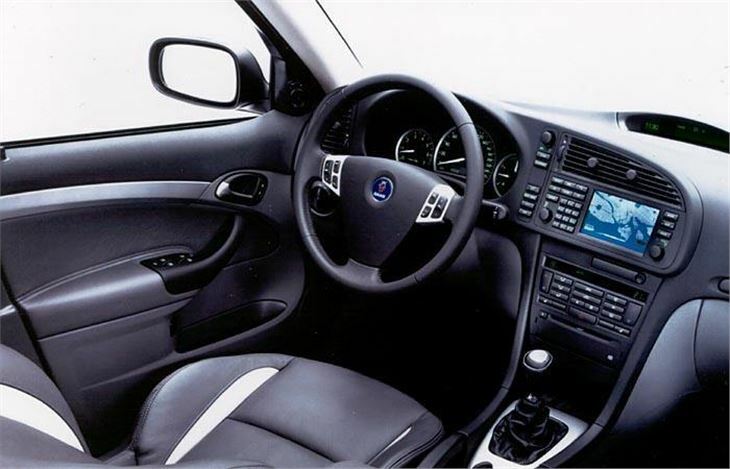 And in the new 9-3, the management electronics are all SAAB’s. Whereas GM’s chain-cam 2.2 puts out 142bhp and its older belt-cam 2.0 turbo delivers 187bhp, SAAB’s chain-cam 2.0 turbo comes in outputs of 150bhp, 175bhp and 210bhp. To fit in with BMW and Mercedes new habit of categorising engines by power output rather than capacity, they’re called 1.8t, 2.0t and 2.0T. Pick of the bunch is the 175bhp 2.0t, preferably riding on the Arc spec 16” alloy wheels with 50 rather than 45 section tyres. The engine is smooth and pleasant to drive and revs sweetly with no boomy noises or jerks in its power delivery. 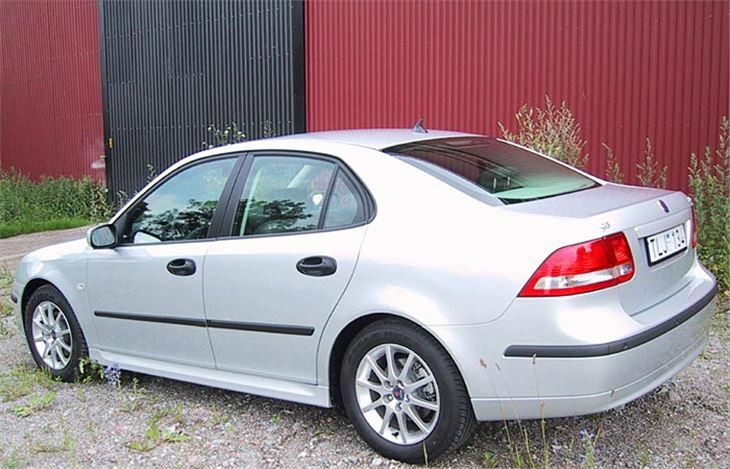 You can have it with a five speed manual or five speed automatic box, and both are good, but if you go for the auto it’s essential to pay just £75 extra for SAAB Sentronic steering wheel gearchange buttons. If you don’t, you’re stuck with a counter intuitive Tiptronic style floor-mounted manual override which is too confusing and too much of a stretch for safe press-on automatic motoring. Another small carp is that, on LHD cars at least, the brake pedal is set too central to be comfortable for left foot brakers. The top spec 210bhp 2.0T Aero is quite a bit faster, of course, with 200kph attainable fairly easily where conditions allow. But the six-speed manual prototypes we drove were fitted with very vague and rubbery gearshifts which, on the change from 2nd to 3rd, made hot acceleration runs very difficult. This, like the steering wheel pushbuttons of the automatic, is still under development and won’t actually arrive in the UK until 2003, but with the 2.0T we all much preferred the autobox. Inside the car everything is impressively solid, as you’d expect of a SAAB. There’s a gimmicky dashboard cupholder that pops out with a gymnastic double somersault and will amuse passengers not familiar with it. The dashboard itself rises like a cliff face and you feel very well protected by it, but shorter drivers should make sure they’re happy with this before laying out any money. The seats are just fantastic. Once you’ve fiddled around with the multi-adjustable driving position even back pain sufferers are happier sitting in the car than they are sitting almost anywhere else. For anyone whose car is their office, these seats are near perfect. Though a saloon, the rear seatbacks fold 60/40. 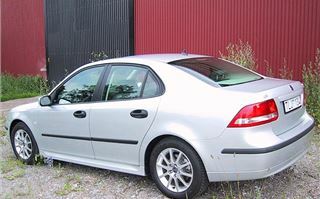 There’s also plenty of room in the back, three proper rear seatbelts, improved SAAB Active Head restraints, load limiting seatbelts, dual stage front airbags, seat-mounted side airbags and side curtain airbags: effectively all the secondary safety items you’d expect of a SAAB. Naturally enough, the company expects a Five Star rating when the car is tested by NCAP. On top of that, apparently, the 9-3 is also elk-proof. One of the main causes of single car road tragedies in Sweden is hitting an elk on a forest road. Because the weight of the elk is in its body and its legs are comparatively spindly, if a car hits one at speed the elk’s body can take the car’s roof off, together with the passengers heads. 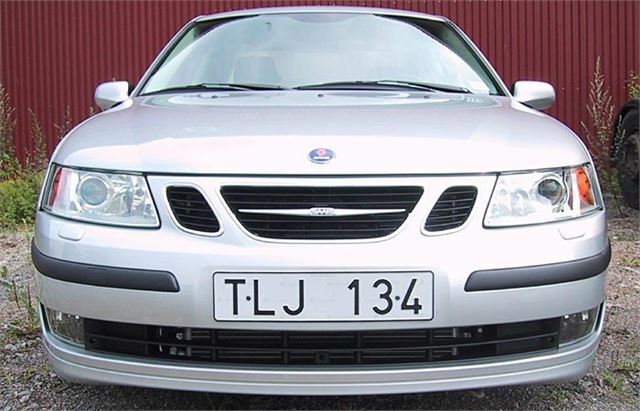 So, for many years now, SAAB and Volvo have built extra strength into the front windscreen pillars and roofs of their cars. In Sweden, in most cases, the elk will go over the roof rather than remove it. In Britain, the extra strength makes the cars that extra bit stronger in rollovers and under-truck crashes. 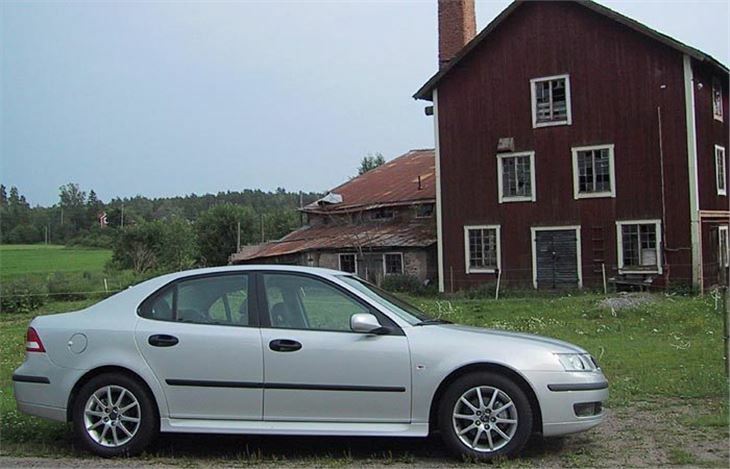 SAAB now talks of 18,000 mile oil changes and, though the turbos are watercooled and less likely to cook engine oil than oil cooled turbos, I can’t go along with that. 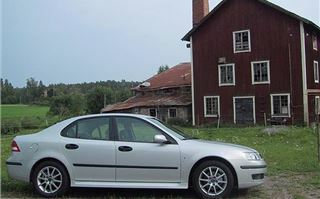 What is very good, though, is that SAAB electronic diagnostics are going on-line. The computers will be permanently hooked up on broadband so that the terminal next to the car is always automatically updated with the latest technical service bulletins even if they were only issued seconds previously. In-car communications systems are Bluetooth enabled so mobile phones, PDAs and notebook computers need no physical connection to the integrated car system. SAAB’s own satnav system is optional or pre-fitted according to spec level. Specs are: ‘Linear’, which sits on 15” alloys and has fabric upholstery with anthracite trim; ‘Arc’, which comes on 16” alloys with leather upholstery and polar wood trim; ‘Vector’, which has 17” alloys and sports leather/textile upholstery with matt chrome trim; and the flagship ‘Aero’ with lowered sports suspension and 210bhp turbo engine only. Diesel lovers can still opt for the 125 bhp 2.2 GM unit, but with five-speed manual box only. 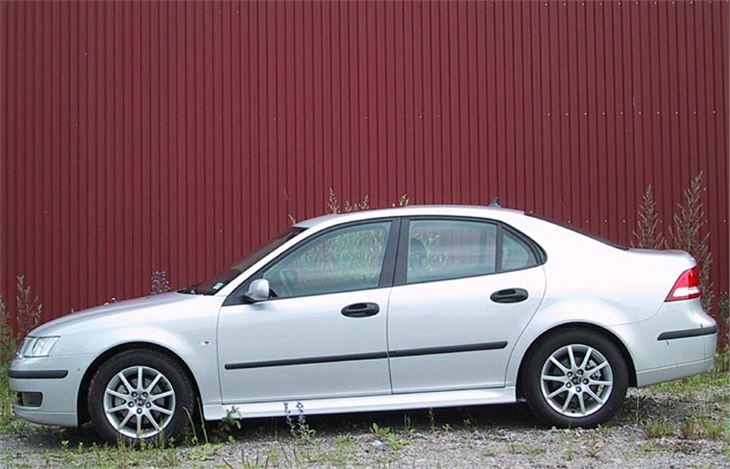 But one SAAB feature has gone. Though the ignition switch is still on the console behind the gearlever, it’s a modern electronic device and no longer locks the gearshift in reverse. 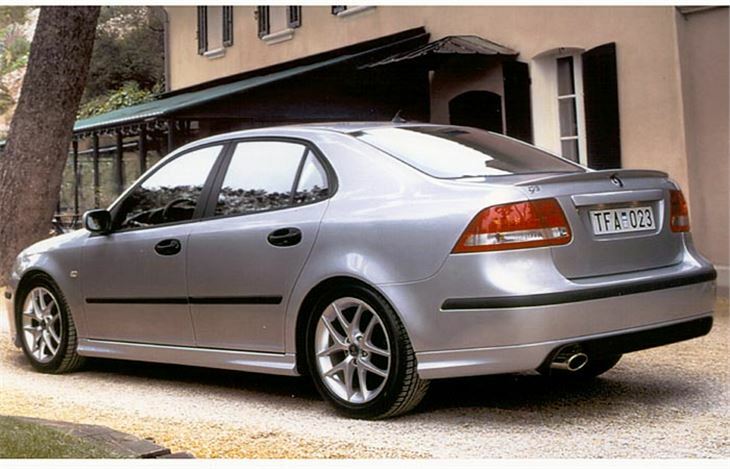 The 9-3 is up against the Audi A4, BMW 3-Series, Mercedes C Class, Volvo S60, Lexus IS200 and Jaguar X Type, which SAAB sees as its natural competitors. I’d have to add the Rover 75 and MG ZT. The A4 is a smarter, classier act, but doesn’t ride and handle as well. The BMW is more rear-drive sporty and more fun to drive, but doesn’t ride as well and equivalent performance costs more. The C Class is dearer and is only just getting its new high-tech supercharged 1.8 engines. The Volvo S60 isn’t as complete a car and lacks rear head and legroom. The Lexus IS200 is a one engine range and not such a good long distance car. For the same money, a 9-3 2.0t is a better car to drive than a 2.1 X Type. The Rover and MG have their Brit appeal, but their chassis aren’t quite as good. Of course, at the end of the day you’ll choose the car that suits you. 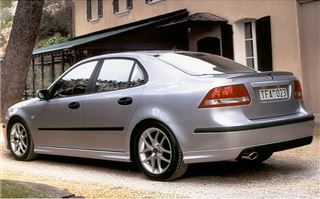 But the new SAAB 9-3 definitely deserves a place on the list and, preferably, an extended test-drive.